YUM! A word to make you smile. What food makes you say yum? A big bowl of pasta? A ripe peach? A slice of a decadent chocolate cake? 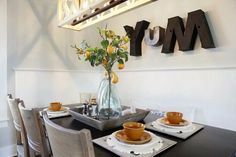 Whatever it is, after seeing the word YUM on a kitchen wall in an episode of Fixer Upper on HGTV (I seriously love this show--love Joanna Gaines' style), I knew I had to make one. Fixer Upper's consisted of vintage marquee letters. My YUM was created with wood. I then cut the wood, using the very professional lay it out, eye it, grab a piece of nearby wood for a straight edge, pencil out, take it to the chop saw and cut the angle the best you can method. and cut it with a jigsaw. For the middle pieces of the M put the wood face to face and then cut a parallelogram at 45 degree angles. I put the Y and the M together with thin wood pieces on the back. Here is what it looked like prior to painting. There are D rings on the back to hang them, but I also like it sitting on a shelf (aka, they are staged--read my staging confession HERE). Yum--a fresh take on the EAT and maybe inspiration to cook up something wonderful! Love your letters Becky and I love JoJo's style too! Great show and was watching it last night! Oh I love this Becky - pinning ! Awesome! Pinned! And I think everyone is in love with Joanna's style! How cool! Love it!! I like the black marquee ones, but I love yours!! The colors are awesome. Becky, I'm predicting this one to make it to one of the top ten PINNED items of 2014! Soooo love your letters...and the paint colors are awesome!!! Great Job and Thanks for sharing! This is so great, I agree with Laura, I will be seeing this often on Pinterest!! I haven't watched Fixer Upper, I'm looking forward to it! omg, I love your letters !!!!!!!! and yes, I love Fixer Upper !!!!!!!!!!!!! I love this so much. I'm going to try it.